Bay Beans produces the best value premium coffee beans online with Free delivery anywhere in Australia. Owner and master roaster, James, guarantees the quality and freshness of his coffee beans, which are roasted fresh for your coffee machine, plunger or filter. James founded Bay Beans at Nelson Bay in 2006 based on his passion and enthusiasm for premium quality coffee beans. James individually hand roasts and packages your fresh gourmet coffee beans, which are delivered free to your door, anywhere in Australia. "Bay Beans coffee beans smells delicious!" "I am really impressed, fabulous service"
Buy fresh roasted Coffee Beans online at Bay Beans and save money, with Free Delivery, anywhere in Australia. Ordering your coffee beans online from Bay Beans is unique. Your experience starts online when you place your order. You can expect to receive a personal confirmation of your order and you deal directly with James, so you know your custom is valued. Your beans are hand-roasted and packaged within 24 hours for delivery to your door, fast! All Bay Beans coffee orders are roasted fresh to ensure maximum freshness and quality. If you need advice selecting coffee beans or getting a better coffee from your coffee machine, James is happy to be your first port of call. 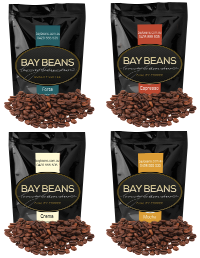 Bay Beans coffee beans is the best value premium coffee beans available online in Australia. Our guarantee to you is the best quality gourmet coffee beans at the best possible price. Your coffee beans are carefully packed in foil-lined bags with one-way valves to seal in the freshness, and then lodged with Australia Post or Courier for free delivery to your door. Opening a Bay Beans coffee package is caffeinated aromatherapy! Bay Beans coffee beans offers the most competitive coffee beans prices, with no hidden surprises at checkout. Delivery on all orders is free to anywhere in Australia, offering you a double savings on both coffee prices and postage. Enjoy an extra discount of upto 20% with our Coffee Subscription service or if you are purchasing coffee beans for your office, cafe, business or social group, purchases of 10kg or more receive a generous 30% Wholesale coffee beans bulk buy discount. If you like Chai Tea, you will love our Chai Latte. From the time you place your order to the time your coffee is lodged for delivery is generally less than 24 hours, so you could be enjoying your freshly roasted gourmet coffee beans within three days of purchase! Bay Beans uses specialty and seasonal coffee beans to create the most flavoursome blends to suit your individual palate. Do you need to learn more about the right coffee blends, coffee equipment or coffee extraction techniques to experience a better cup of coffee? James is delighted to guide you. We offer complimentary newsletters, eBook and ongoing coffee offers.